So, Your Animal Hospital Got a Bad Review. What Do You Do Now? Reviews, as a concept, are everywhere in our consumer-driven environment. When you are going out to dinner, odds are the place you are headed to has a number of reviews—both good and bad—publicly available on Google, Facebook, Yelp and anywhere else reviews are posted. By the time you read this, there could even be a new platform available for people to leave reviews for businesses. To put all of this into even more perspective, there are even Yelp reviews of Yelp, if that makes any sense. Other than restaurants, you can find reviews for things like movies, hotels, shoe stores—basically anything, including veterinary hospitals. And while the concept of people leaving feedback for products and services is a good idea, in theory, the reality is that this content primarily lives on the internet, which, as we all know nowadays, isn’t always the best purveyor of accurate information. Because of this, we at iVET360 put a heavy emphasis on educating hospitals and the veterinary industry on the importance of online reviews and reputation management. Reputation management is basically digital damage control—as in, replying to negative reviews online to protect your reputation. Unfortunately, people often believe that the customer is always right, meaning, no matter how good your service is, how fair your prices are or how positive your staff is, someone will find something to criticize and will do so in the form of an online review. These reviews usually allow them to leave a comment and give you a score (often on a one to five scale), which anyone can see. To a veterinary hospital, one bad review (or reviews) can mean the difference between a client visiting your practice or moving on to a better-reviewed hospital. Plus, individual reviews on Google, Facebook and Yelp are combined to create one cumulative score for each platform—this score is often displayed bright and large on these outlets, for everyone to see. The point is, if your practice doesn’t address bad reviews by either responding publicly or flagging them (more on that later), these negative words will linger on and will affect your business for the worse. You Got a Bad Review. How Do You Address This? Before you hammer away on your keyboard to defend your practice from a negative, unfair review, it’s important to remember that your response will be public for everyone to see. Therefore, first and foremost, you must reply in a courteous, professional manner. When you reply, try to employ an empathetic and understanding tone, and, depending on the scenario, be careful to not admit fault. Then, make sure to double-check your response for typos and grammatical errors. Finally, finish your reply by encouraging the reviewer to communicate with you directly to address any issues—this way, it takes this conversation offline, so it’s more personal and away from public eyes. Beware—fake reviews are a reality. Why do people do this? Who knows—it’s just one of the many vast mysteries of the internet. Someone may have too much time on their hands, so they’ll troll a business, or maybe even a nefarious competitor has decided to make a fake account to give you poor feedback. Regardless, fake reviews are a thing, and it’s important to recognize them and flag them. Characteristics of fake reviews typically include poor grammar, nonsensical information and/or no feedback at all. To combat these lazy hit jobs, you need to contact an administrator of the site where this fake review has been posted, to see if they can intervene on your behalf. For Google, see their instructions here or you can also either tweet them at @GoogleMyBiz or message them on Facebook. Usually, they respond in one to five business days. 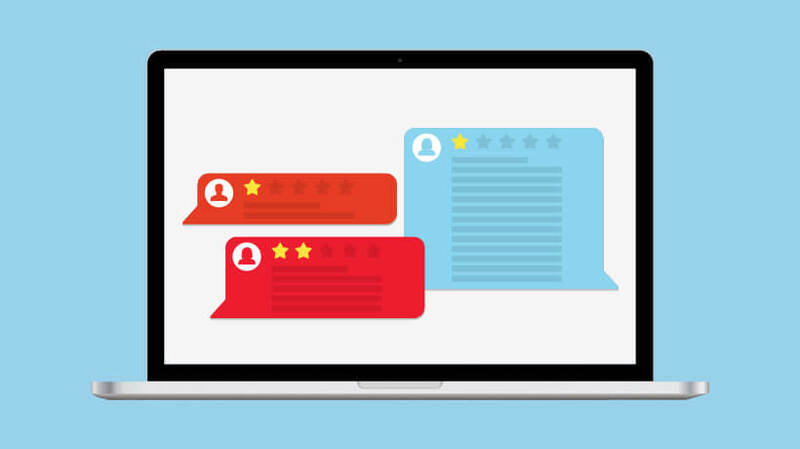 Now that we’ve gone over who to contact to troubleshoot negative and fake reviews, let’s lift ourselves up and talk about one of the best problems your hospital can have—what to do about positive reviews. How Do You Address Positive Reviews? Good online reviews are the ultimate compliment—they’re basically free advertising and they let you and your staff know that someone took the time to say some nice things about you. This feedback does more than just assure your practice that you’re already doing the right thing— it helps your business grow because people will, in fact, choose your hospital based on its public perception. But it’s no good to just read a positive review—it’s important to reply to these to continue to show your clients why you appreciate them. Before you do respond, remember to give yourself a nice pat on the back and round of applause—then, try to keep your response as brief, friendly and as personal as you can. Also, do not say the same exact thing for every positive review. Just take the extra time and address each one individually. As we mentioned twice earlier, good reviews are pretty much free advertising. And while they are fun to read and reply to, they can get overwhelming, especially if you have to sift through them to also reply to the bad reviews, which can easily become a chore. Of course, if you don’t want to undertake the task of managing your practice’s reputation and answering your online feedback, there is a convenient, easy solution. You could just have someone else handle it for you. At iVET360, we are armed with teams of marketing managers and copywriters that will address and reply to online dialogue in a voice that stays true to your practice. Our specialists will work with your hospital to help make sure that your reputation stays intact by not only answering the good reviews, we’ll also do the dirty work of monitoring and replying to unfair and misleading reviews. As a veterinary services company that operates on a no-contract basis, our experts can help your practice not only with marketing but analytics and HR and training, too. For additional information and more details about our suite of services, which includes everything from logo/brand design, supervisor skills training, revenue optimization and more, contact us today and let us help you improve your veterinary hospital one step at a time.